Health and Family Welfare (B2) Department. A. By GO 302 dated 20-11-2006 the government, in exercise of the powers conferred under rule 48 of the General rules contained in part II TN state and subordinate Service Rules in Vol I of the TN Service Manual relaxed rule 10 (a ) (1) of General Rules for TN state and subordinate Services to enable the government to appoint 153 contract medical officers and 1352 Contract medical Consultants temporarily as Assistant Surgeons without any exams being conducted, in the TN Medical Service pending passing of Special qualifying exam proposed to be conducted by the TNPSC for regularizing their services. This appointment was not done through the appointing Authority (Director of Public Health and Preventive Medicine, Chennai). However it is pertinent to note that the some doctors who were not even registered in Employment Exchange were given postings. Moreover a doctor who had registered later in one district was given posting before another doctor who had registered earlier in another district as appointments were made district wise. B. By GO No. 302 dated 20-11-2006 they were permitted to appear for the special TNPSC and they were appointed as Assistant Surgeons temporarily in the TN Medical Service in relaxation of rule 10(a) (1) of the General Rules. when the services of the contract doctors were regularized and they joined as permanent Assistant Surgeons in Tamil Nadu Medical Service. The Petitioners have no objection in the regularization of the services of the 153 contract medical officers and 1352 Contract medical Consultants . However even before GO No. 302 dated 20-11-2006, 213 contract doctors passed the TNPSC exam and pursuant thereto they were appointed as Assistant surgeons w.e.f from 29-06-2006. 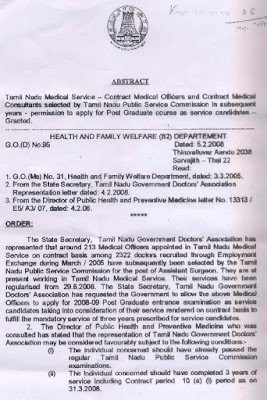 C. But the Petitioners are aggrieved by the GO 95 dated 05-02-2008 by which the period prior to their appointment as Assistant Surgeon on 29-06-2006 after passing the TNPSC exam (excluding their leave period ) it has been stated that their services as contract doctors shall be taken into consideration in order only to apply for Post Graduate course as service candidates to fulfil the mandatory service of 3 years as on 31.03.2008. As already mentioned there are 213 such Assistant surgeons who fall under this category and will get the benefit of this GO. It has to be noted that the same GO states that medical officer should not claim the period prior to 29-06-2006 for retrospective regularisation of their services in the post of Assistant Surgeon. Thus while the working as contract medical officers during the period prior to 29-06-2006 is not taken note of for regularisation with retrospective effect it is arbitrary to take note of the period while they worked as contract medical officers prior to their regularisation of service ie 29-06-2006 (excluding their leave period) shall be taken into consideration in order only to apply for Post Graduate course as service candidates to fulfil the mandatory service of 3 years as on 31.03.2008. There is no rationale for giving the benefit of mandatory 3 year period to contract medical officers even before their services were regularised after qualifying in the TNPSC exam. The Petitioners qualified in the TNPSC exam much before the said Contract Medical Officers & Consultants and they cannot be asked to compete with persons who have not put in mandatory service of 3 years after qualifying in the TNPSC Exam. The petitioners are MBBS doctors who have been regularly appointed as Assistant Surgeons in the Tamil Nadu Medical Service after passing the TNPSC exam even in the year 2000. 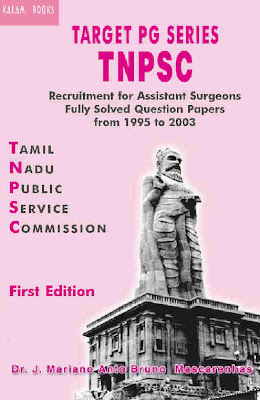 Thus permitting Assistant Surgeons appointed on 29-06-2006 and who have not put in 3 years of regular service after passing the TNPSC as on 2008 to write the PG entrance test along with Assistant Surgeons who passed the TNPSC in the year 2000 and got regularly appointed as Assistant Surgeons in the Tamil Nadu Medical Service in the year 2000 satisfying the 3 year mandatory requirement amounts to treating unequals as equals and thus violating article 14 of the Constitution. The GO 95 dated 05-02-2008 is liable to be set aside as violative of article 14 of the constitution. 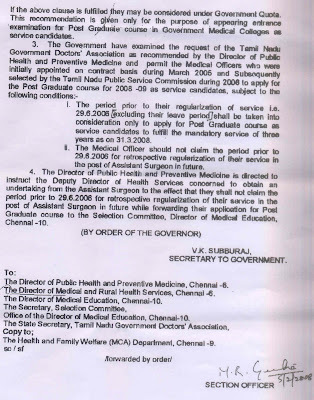 D. The prospectus for the Post Graduate exams for 2008-2009 which is proposed to be conducted on 24.02.2008 has laid down a number of eligibility criteria among which doctors who are in Service and who have less than 3 years mandatory service after being selected by regular TNPSC would not be qualified as service candidates (CLAUSE 23). Besides that Clause 55 of the said Prospectus also lays down that Medical Officers selected by the TNPSC and appointed in Tamil Nadu Medical service on regular basis who have put in a minimum of 3 years continuous service as 31.03.2008 will be treated as Service candidates . The number of PG seats available for service candidates is approximately 250. 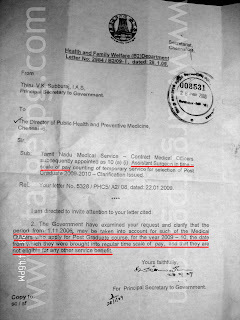 Therefore it will highly prejudicial to the petitioners and similarly placed service candidates if around 213 contract doctors who do not have the mandatory 3 year after passing the TNPSC are being allowed to be considered as service candidates under the impugned G.O to compete with the Petitioners for the PG seats reserved for service candidates it will affect the chances of the petitioners in getting admission to PG Course. GO 95 dated 05-02-2008 is illegal in so far as it allows the said 213 contract medical doctors to write the PG exam as service candidate. E. Even while the Contract doctors were appointed as medical officers and consultants they were clearly informed in G.O.No.197 dated 07-06-2004 and GO 31 dated 03-03-2005 that the contract appointee shall not claim any rights as a full time member of service since it was purely a contract appointment and the contract period shall not give entitlement to claim eligibility for admission to a post graduate course as a service candidate and that the contract appointee shall not be entitled to probationary or any other rights. Hence it is unreasonable to suddenly change the policy and take the period of contract employment for the purpose of the 3 year mandatory government service and make them eligible for the PG seats reserved for Service candidates having 3 years mandatory service while the 213 contract doctors passed theTNPSC exam only in 2006 and got regularly appointed as Assistant Surgeon in Tamil Nadu Medical service only on 29-06-2006.Any change in policy should be informed by reason. No reason has been assigned to permit the 213 contract doctors to have the benefit of the contract period for reckoning the 3 year mandatory requirement of service except to state that the impugned G.O. has been passed based on the representation of the 3rd Respondent Association and the recommendation of the 2nd Respondent. The Impugned G.O is arbitrary and is liable to be set aside. CHENNAI: The Madras High Court has said that PG medical degree/diploma holders who applied for the courses through all India entrance examination for selection to seats under all India quota and were admitted to government medical colleges in the State in 2005-06 are not bound by the terms and conditions issued by the Tamil Nadu Government authorities in their prospectus. In his order on a batch of petitions, Justice N. Paul Vasanthakumar said even if any candidate had executed bond, it would have no effect since they had not applied for admission under the impugned prospectus. The Judge said candidates admitted under the State quota under the non-service category were bound by the terms of the bond executed by them pursuant to the prospectus. On completion of their course, they were bound to serve in government colleges/hospitals according to the availability of posts for three years, failing which it was open to the State government authorities to recover Rs. 2 lakh/Rs. 3 lakh as the case may be as per the bond conditions. The court directed the respondents to return all the petitioners’ certificates within two weeks. Mr. Justice Paul Vasanthakumar said no PG/Diploma holder, who completed their course or joined in government service temporarily as per the bond, should be denied opportunity of applying for super-speciality course. If they were selected, they should be permitted to undergo the course subject to the condition that the remaining period of service should be served in government institutions by the persons concerned after completion of their respective super speciality course. If not, it was open to the respondents to recover the bond amount with proportionate amount. The case of the petitioners who were admitted under the all India quota was that they did not apply for admission to PG degree/diploma course before the respondents (State government authorities) as per the prospectus issued by the respondents for admission for 2005-06. They appeared for all India entrance test in respect of all India seats. Based on their marks in the entrance examination and as per their choice of the course/colleges, they were selected and admitted to medical colleges in Tamil Nadu. The candidates contended that the prospectus, particularly a Tamil Nadu G.O. issued in June last year as well as the circular issued by the Director of Medical Education of April this year were not applicable to candidates admitted on the basis of selection made under the all India quota. New Delhi: The Supreme Court on Monday posted for final hearing on January 23 a batch of appeals against a Kerala High Court judgment directing the Kerala Public Service Commission (PSC) to follow the rules of reservation in appointments in the State and subordinate services in the ratio of 50:50 for merit and quota candidates, taking 20 vacancies as a unit. A Bench of Justice R.V. Raveendran and Justice J.M. Panchal, while fixing the appeals filed by the PSC, Nair Service Society (NSS) and others for final hearing on January 23, asked the Kerala government to file its response to the appeals seeking stay of the impugned judgment dated May 23, 2008. Senior counsel K.K. Venugopal appeared for NSS, senior counsel, T.L. Viswanatha Iyer for the PSC and senior counsel P.P. Rao for the State government. In its appeal, the PSC submitted that the Constitutional validity of Rule 14(a) and (c) had not been challenged before the High Court in the writ proceedings.